Context: Nondisclosure of cancer diagnosis is common in many Eastern countries. Consequently, immigrant families often approach oncologists with requests for nondisclosure in Western countries. Aims: To explore differences in the attitudes and practices of Western-born and nonWestern born oncologists in Australia when faced with a nondisclosure request. Settings and Design: Using a cross-sectional design, oncologists were interviewed over the telephone. Methods: Using the snowball method, 14 Australian (Western = 9, non-Western = 5) oncologists were recruited. Oncologists participated in a semi-structured interview exploring their experiences of, and response to, a request for nondisclosure, and their perceptions of how their cultural background influenced these attitudes and responses. Analysis: The interviews were transcribed and analyzed using interpretative phenomenological analysis. 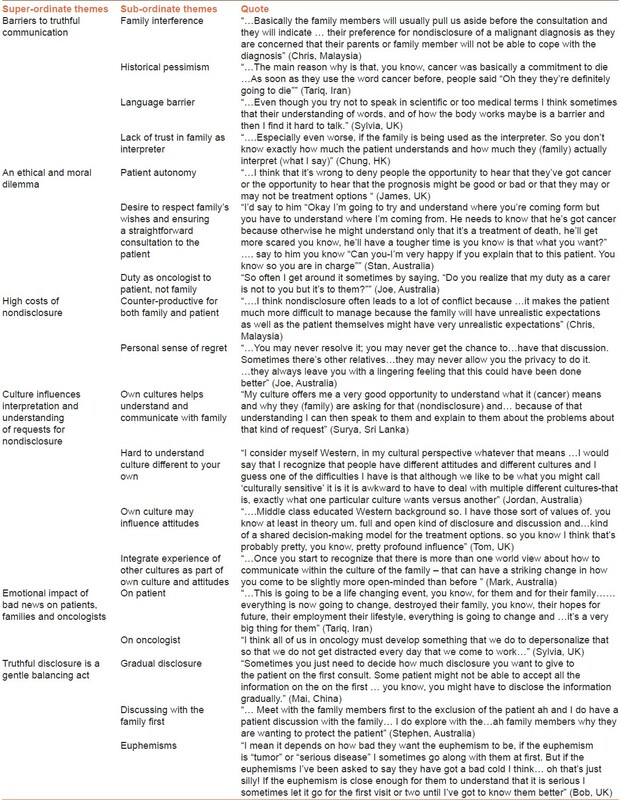 Results: Six main themes emerged from the study: (1) Barriers to truthful communication, (2) an ethical and moral dilemma, (3) high costs of nondisclosure, (4) cultural influences on interpretation and understanding of requests for nondisclosure, (5) emotional impact of bad news on patients, families and oncologists, and (6) truthful disclosure as a gentle balancing act. Conclusions: All oncologists felt that the family request for nondisclosure was difficult, with many cultural and emotional nuances to take into consideration. Some immigrant Australian oncologists who had a similar cultural background as the patient/family, felt they could better understand the desire for nondisclosure. Irrespective of their cultural background, all oncologists acknowledged that breaking bad news had to be done in a gentle, gradual manner. The study suggests a need to develop a culturally sensitive cancer communication model. Contrasting to Western medical practice, oncologists in Eastern countries comply with this family-centered approach by routinely communicating diagnosis and prognosis information to families, allowing them to make disclosure and other medical decisions for the patient. ,, However, while a number of studies have explored oncologists' responses to nondisclosure requests, there is no published research that has explored the role of oncologists' own culture on these responses within a multicultural Western environment. Therefore, the current study explored differences between Western and non-Western-born oncologists in the way they interpreted and dealt with the family request for nondisclosure in Australia. Eligible participants were oncologists (medical, surgical, and radiation) practicing in Australia. Participants were recruited using snowball and purposive sampling. Three E-mails were initially sent by the Medical Oncology Group of Australia (the peak representative body for medical oncologists in Australia) to their membership, detailing the study and requesting interested oncologists to E-mail the lead researcher. Following their interview, participants were asked to nominate other oncologists, inform them about the study and if they were interested, provide them the researcher's E-mail address to contact. The researcher then contacted these oncologists to obtain informed consent. The researcher particularly sought to balance the sample with Western and nonWestern-born oncologists. Recruitment continued until informational redundancy (saturation of themes) was achieved, with three consecutive interviews yielding no new themes. Semi-structured interviews with open-ended questions were developed to focus on oncologists' experiences of a request for nondisclosure, how their cultural background influenced their attitudes, and how they handled the issue of nondisclosure [Table 1]. Interviews were conducted by a psychologist trained in qualitative methods, recorded over the telephone, and subsequently transcribed and analyzed. Each interview took approximately 40 minutes. Ethical approval for the study was obtained from the Human Research Ethics Committee at the University of Sydney. The study used interpretative phenomenological analysis,  a qualitative research methodology that is primarily interested in understanding a homogenous group of individuals' subjective accounts or perceptions of certain events or experiences they commonly experience. Emergent themes based on the authors' interpretations of the recorded interviews were noted for each transcript, and characteristic quotes were identified to exemplify each theme. Themes were then checked for emerging patterns, differences and consistency, similarities across participants and the role of specific accounts. From these, super-ordinate themes were iteratively developed, which were used as a basis for clustering sub-ordinate themes when analyzing subsequent transcripts. Pseudonyms have been used for all quotes. Whole or part quotes presented in the text are italicized. Full quotes for each theme and subordinate theme are presented in [Table 2]. Fourteen oncologists (12 males, 2 females), aged 34-57 years, participated in the study, of whom nine were Western and five were non-Western-born [Table 3]. Six themes were identified. All oncologists commented that there were several barriers to truthful communication, when they saw an immigrant patient. A family request for nondisclosure was the first and "biggest" barrier to truthful communication, which challenged their ability to talk honestly to patients at the outset. Oncologists observed that family interference was due to many reasons: Firstly a belief that a cancer diagnosis was tantamount to a death sentence, stemming from immigrancy at an early age, which left families without access to the information they could understand and marooned them in the medical world of their childhood. As a consequence family members feared that cancer disclosure could result in poor psychological outcomes for the patient, that they may refuse treatment, lose hope, die immediately after disclosure or not be able to cope with the news. Five Western-born oncologists reported that another barrier to truthful communication was not sharing a common language with the patient, as this led to a "superficial," nondirect relationship with the patient conducted through family or professional interpreters. With such patients they often found it challenging to understand their level of awareness of their illness or desire for additional information. Further, oncologists noticed that while patients were comforted by having an interpreter who could speak their language, professional interpreters were also impersonal, as "it's not their job to be involved in the human interaction". Consequently, they felt distanced from their patients and unable to offer them a personalized relationship and emotional support. While the family did add value in terms of creating an emotionally supportive consultation, five Western oncologists and one non-Western-born oncologist (Chung) observed that the language barrier was made more difficult when families were interpreters. They suspected that family members did not always translate what they were really saying, thus interfering with the doctor-patient relationship and breeding mistrust in the relative as an "unreliable" interpreter. All participant oncologists recognized that the family's request for nondisclosure posed an ethical and moral dilemma. Administering patients "toxic", "poisonous" and "aggressive" medication without them being fully informed of their condition and the reason for this treatment, made oncologists very "uncomfortable." The oncologists believed relatives were thus denying patients their "natural right" to make their own treatment decisions. However, most Western (6) and two non-Western-born (2) oncologists also acknowledged the importance of respecting the family's wishes. Thus, they felt caught in a moral dilemma between respecting family wishes and ensuring patient autonomy. These oncologists observed that there was "art" in how they tackled this dilemma, which included being empathic, reassuring, inclusive yet firm when explaining to nondisclosing families the need for disclosing necessary information to patients. A small number of oncologists (Western = 3, non-Western = 2) felt their duty was towards the patient and not the family, since it was the patient who was receiving their treatment. These oncologists felt that nondisclosure to any degree was an act of deception they strongly opposed. Therefore, they confronted the family by telling them they would not partake in any dishonesty surrounding diagnosis disclosure. This attitude toward nondisclosure was supported by the belief that patients already knew they had cancer by virtue of the name of the cancer center, having seen previous oncologists or having gone through a long treatment or diagnostic process. Patient's awareness was deduced by the oncologist either by observing the patients' body language or by simply asking prompting questions such as, "What do you understand about what the tests have shown?" (James). Five Western and one non-Western oncologists reported that the costs of the nondisclosure are multipronged and high. The most common concern was the potential impact of constrained family communication on the patient, due to their inability to freely discuss the disease leading to "unrealistic expectations," "unanswered questions" and patients being unable to express their fears. Unfulfilled communication was viewed as especially problematical at the end of life, as patients were not given the chance to put their affairs in order and "communicate with the important people in their life." This sense of unfulfilled communication was heightened when families used various strategies to request nondisclosure even before the oncologist met the patient, ranging from calling in advance, speaking in English if the patient was not English-speaking, to leaving the oncologist a note or message, or "catching" or "ambushing" the oncologist in the hospital corridor before they entered the consulting room. One oncologist, Joe, reported that nondisclosure resulted in a personal and "lingering" sense of regret that he could have done things better. Indeed, oncologists Stan and Jordan observed that another cost of nondisclosure was inferior supportive and potentially medical care for the patient. Oncologists (Western = 4, non-Western = 4) reported that nondisclosure was more commonly requested by families from collectivist/family-centered cultures such as Chinese, Korean, Greek, Italian, Arabian than those from Western cultures such as Australian, UK, US. All non-Western oncologists reported that their own culture helped them to understand cancer nondisclosure, while all Western oncologists reported that they found it difficult to understand cultures different from their own. Non-Western oncologists felt they could be more sensitive to patients from a similar background at the outset, choosing a more "nondirect" communication style and being "cautious" in their use of the word "cancer". They also felt they better understood and could more easily accommodate the family-centered approach to medical decision-making. However, due to their medical training in the Western system, they still maintained a positive attitude towards full disclosure. On the other hand, Western oncologists reported that they struggled with understanding a "different way of thinking ," feeling "affronted" by nondisclosure. Western oncologists also felt "uncertain" about how to interpret nonverbal cues (e.g. smiles, gestures) as each culture might have a different meaning for these. Four Western oncologists noted that their "dominant, middle class, educated" background that followed a "strong medical legal flavor, which is about giving people information, making sure that they've got the choices" (James), had a "profound influence" on their attitude toward nondisclosure. However, they also felt that they had to "adapt" their style of communication to suit the patient's background by choosing "culturally sensitive language" and diverse ways to share medical information. A few Western oncologists (Mark, Stan and Tom) consciously tried to be more open to and respectful of a "different world view". Some oncologists (Western = 2, non-Western = 2) noted that breaking bad news can have an emotional impact not only on patients, families but also oncologists. They understood that a cancer diagnosis has the potential to permanently change a person's and their families' life in many dimensions such as their occupation, lifestyle, dreams and hopes. These oncologists viewed emotional support as an integral part of their role. This was achieved by being attentive to patients' emotional needs, listening to and being "tuned into" their "emotional requests" and normalizing their responses. This required oncologists to guide patients through this emotional journey, while assisting families to overcome their personal fears and anxieties in order to care for their ailing patient. Three oncologists, Sylvia, Stan and Surya, felt their personal experience of losing their parent to cancer sensitized them to the "receiving end" of bad news, better equipping them to provide support. Indeed, all four oncologists admitted that a cancer diagnosis disclosure had an emotional impact on them as well, making breaking bad news "quite hard". They reported that coping by "depersonalizing" and distancing themselves protected them from getting "distracted" during work, a skill which came with time and exposure to breaking bad news. All oncologists agreed that cancer disclosure should be approached within a growing relationship in a gradual and "systematic" manner where patients had the opportunity to steer the communication. This step-by-step approach was described as an "art," which aimed at ensuring patients and families feel secure and reassured. Consequently, oncologists observed, disclosure took place slowly over several meetings, wherein they gauged patients' and families' levels of acceptance of the information that was discussed in each meeting. First understanding families' concerns regarding truthful disclosure and then empathically convincing the family about the benefits of disclosure was preferred by most oncologists (Western = 5, non-Western = 4). Giving families the time to share their reasons for nondisclosure helped oncologists to understand their knowledge and perspective. This allowed oncologists to customize their explanations or "appeals" for the need for disclosure in a way that addressed these concerns whilst describing their own ethical obligation to the patient. Further, a small group of oncologists were also inclined to consult families about their disclosure plan; discussing how and to what extent they should break the news, how the patient would receive news, and how they as a family could offer support at the time of cancer disclosure. The driving force for this approach was the oncologist's desire to develop a "very good relationship" between all parties, by ensuring clarity in cancer communication and "keeping the peace" between family and patient. These oncologists believed there was no one way to break the bad news to patients, instead being sensitive and building patient trust was a key feature of being honest. This meant they had to gently balance open communication (with the help of the family), such that they were neither "sugar-coating" vital medical information, nor "shocking" the patient with too much information. Appreciating the cultural connotation of the word "cancer" played a key role in the way bad news was broken to patients. Almost all (Western = 7, non-Western = 4) oncologists were not opposed to using euphemisms, as long as the patient was able to understand its implications. Using words such as "tumor," "growth" or "lump" was most favored by oncologists as an acceptable approach to communicate "what's going on" to patients, without threatening them or their families. However, although they did arrive at this compromise in consultation with the family, oncologists clarified that the choice of euphemism had to be a "close enough" description of the seriousness of the real disease. Sometimes, this meant they had to eventually find a way to use the word "cancer" in their consultations. Only two oncologists (Jordan and Tariq) disagreed with this approach as they believed that by "diluting the message" they were, in effect, lying to the patient. The current study explored differences between Western and non-Western-born oncologists in the way they interpreted and dealt with the family request for nondisclosure in Australia. The findings revealed that oncologists reported family and language were barriers to truthful communication, the family request for nondisclosure posed an ethical and moral dilemma to them, oncologists felt there were high costs of nondisclosure to patients and their families, they agreed that there were cultural influences on interpretation and understanding of requests for nondisclosure, they observed an emotional impact of bad news on patients, families and oncologists, and they believed that truthful disclosure was a gentle balancing act. The study highlighted that oncologists experienced a tug-of-war between their desire to be culturally sensitive and their Western medical ethics. They accommodated the central role of families in patients' lives by using euphemisms, eliciting the family's fears of disclosure, focusing on family comfort, and by a willingness to consult with the family on how to break the news. However, oncologists also did not want to disregard their medical ethics. For example, some were willing to use a euphemism for "cancer," but only if it did not stray far from the truth, thereby misleading the patient. Consequently, oncologists felt caught in a moral and ethical dilemma, as they struggled to balance their Western need to promote patient autonomy and informed consent with their recognition of the importance of respecting and accommodating family wishes. A unique and key finding in this study was that non-Western-born oncologists felt better equipped to understand and communicate with both families and patients. Perhaps, these oncologists can provide the necessary bridge between the need to adhere to Western medical ethics and the desire to respect the cultural contexts of cancer communication. Hence, it may be important to include non-Western-born oncologists when developing and delivering cultural sensitivity training programs. In this study, oncologists felt nondisclosure carried high costs for the patient and family, who may receive sub-optimal supportive and medical care and be robbed of the chance to finalize affairs and say their goodbyes. Previous research has reported a relationship between nondisclosure and negative patient outcomes (e.g. increased distress, unfulfilled communication, hopelessness), ,,, the avoidance of which were, interestingly, some of the reasons for nondisclosure for some Eastern families. ,,, Further, oncologists reported feeling themselves, a sense of lost opportunity and poor communication due to nondisclosure, suggesting that cultural training could improve their own outcomes. Further, it may be beneficial to include health psychologists/counselors in the communication process to facilitate culturally empathic communication between patients, families and physicians. This study has several strengths and limitations that should be taken into account when interpreting the findings. Its strengths include the inclusion of oncologists who were and were not born in Australia, bringing different cultural perspectives to the question of nondisclosure, and highlighting the contribution that nonnative-born health professionals can make to this discourse. While an in-depth qualitative approach was appropriate in gaining the perspectives of oncologists, and the data reached saturation suggesting that all relevant themes had been elicited, the results may not be generalizable to the wider oncology population, and quantitative research to build on this study would be helpful. Rogg L, Aasland OG, Graugaard PK, Loge JH. Direct communication, the unquestionable ideal? Oncologists′ accounts of communication of bleak prognoses. Psychooncology 2010;19:1221-8. Barnes DM, Davis AJ, Moran T, Portillo CJ, Koenig BA. Informed consent in a multicultural cancer patient population: Implications for nursing practice. Nurs Ethics 1998;5:412-23. Gordon EJ, Daugherty CK. "Hitting you over the head": Oncologists′ disclosure of prognosis to advanced cancer patients. Bioethics 2003;17:142-68. Baile WF, Lenzi R, Parker PA, Buckman R, Cohen L. Oncologists′ attitudes toward and practices in giving bad news: An exploratory study. J Clin Oncol 2002;20:2189-96. Oliffe J, Thorne S, Hislop TG, Armstrong EA. "Truth telling" and cultural assumptions in an era of informed consent. Fam Community Health 2007;30:5-15. Trill MD, Holland J. Cross-cultural differences in the care of patients with cancer. A review. Gen Hosp Psychiatry 1993;15:21-30. Huang X, Butow P, Meiser B, Goldstein D. Attitudes and information needs of Chinese migrant cancer patients and their relatives. Aust N Z J Med 1999;29:207-13. Mobeireek AF, al-Kassimi FA, al-Majid SA, al-Shimemry A. Communication with the seriously ill: Physicians′ attitudes in Saudi Arabia. J Med Ethics 1996;22:282-5. Ferraz Gonçalves J, Castro S. Diagnosis disclosure in a Portuguese oncological centre. Palliat Med 2001;15:35-41. Hamadeh GN, Adib SM. Cancer truth disclosure by Lebanese doctors. Soc Sci Med 1998;47:1289-94. Seamark DA, Blake SD, Seamark CJ, Halpin DM. Living with severe chronic obstructive pulmonary disease (COPD): Perceptions of patients and their carers. An interpretative phenomenological analysis. Palliat Med 2004;18:619-25. Kreuter MW, McClure SM. The role of culture in health communication. Annu Rev Public Health 2004;25:439-55. Ge Gao, Burke N, Somkin CP, Pasick R. Considering culture in physician-patient communication during colorectal cancer screening. Qual Health Res 2009;19:778-89. Barclay JS, Blackhall LJ, Tulsky JA. Communication strategies and cultural issues in the delivery of bad news. J Palliat Med 2007;10:958-77. Ballard-Reisch DS, Letner JA. Centering families in cancer communication research: Acknowledging the impact of support, culture and process on client/provider communication in cancer management. Patient Educ Couns 2003;50:61-6. Shahid S, Finn LD, Thompson SC. Barriers to participation of Aboriginal people in cancer care: Communication in the hospital setting. Med J Aust 2009;190:574-9. Goldstein D, Thewes B, Butow P. Communicating in a multicultural society. II: Greek community attitudes towards cancer in Australia. Intern Med J 2002;32:289-96. Fujimori M, Akechi T, Akizuki N, Okamura M, Oba A, Sakano Y, et al. Good communication with patients receiving bad news about cancer in Japan. Psychooncology 2005;14:1043-51. Chittem M, Norman P, Harris PR. Relationships between perceived diagnostic disclosure, patient characteristics, psychological distress and illness perceptions in Indian cancer patients. Psychooncology 2013;22:1375-80. Dégi CL. Non-disclosure of cancer diagnosis: An examination of personal, medical, and psychosocial factors. Support Care Cancer 2009;17:1101-7. Horikawa N, Yamazaki T, Sagawa M, Nagata T. The disclosure of information to cancer patients and its relationship to their mental state in a consultation-liaison psychiatry setting in Japan. Gen Hosp Psychiatry 1999;21:368-73. Tavoli A, Mohagheghi MA, Montazeri A, Roshan R, Tavoli Z, Omidvari S. Anxiety and depression in patients with gastrointestinal cancer: Does knowledge of cancer diagnosis matter? BMC Gastroenterol 2007;7:28. Chittem M, Norman P, Harris P. Reasons for and for not disclosing, illness perceptions, and psychological adjustment in Indian caregivers of cancer patients. Proceedings of the International Psycho-Oncology Society 14 th World Congress and 39 th Clinical Oncological Society of Australia Annual Conference; Brisbane, Australia: 2012 Nov 13, 15. Zamanzadeh V, Rahmani A, Valizadeh L, Ferguson C, Hassankhani H, Nikanfar AR, et al. The taboo of cancer: The experiences of cancer disclosure by Iranian patients, their family members and physicians. Psychooncology 2013;22:396-402. Ozdogan M, Samur M, Bozcuk HS, Coban E, Artac M, Savas B, et al. "Do not tell": What factors affect relatives′ attitudes to honest disclosure of diagnosis to cancer patients? Support Care Cancer 2004;12:497-502. Yun YH, Lee CG, Kim SY, Lee SW, Heo DS, Kim JS, et al. The attitudes of cancer patients and their families toward the disclosure of terminal illness. J Clin Oncol 2004;22:307-14.28.